Wikipedia Information for Saki/Sake: Sake is a rice-based alcoholic beverage of Japanese origin. It is sometimes spelled saké to show the pronunciation more clearly. This beverage is called sake in English, but in Japanese, sake refers to alcoholic drinks in general. The Japanese term for this specific beverage is Nihonshu meaning “Japanese alcohol”. Sake is also referred to in English as a form of rice wine. However, unlike true wine, in which alcohol is produced by fermenting the sugar naturally present in fruit, sake is made through a brewing process more like that of beer, thus it’s more like a rice brew than a rice wine. 1. Japanese alcoholic beverage made from fermented rice; usually served hot. 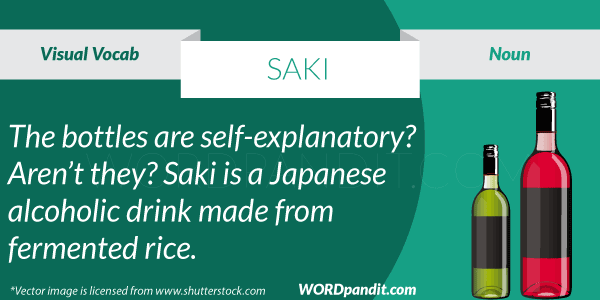 Saki also carries a peculiar meaning. It refers to ‘any of several monkeys of the genus Pithecia, of tropical South America, having a golden-brown to black, thick, shaggy coat and a long, bushy, nonprehensile tail.’ Do look up their images in google images. Pop Quiz: Which author had the pen name Saki? Do look this up as well.